Golf can seem like an uphill battle under the best of circumstances. It becomes even more challenging when you’re literally playing uphill. The scenario: Your ball lies on a hill that slopes directly away from the target, usually the green. While the ball is level with your feet, the hill’s angle has you leaning on your right (back) foot. It’s an awkward feeling. 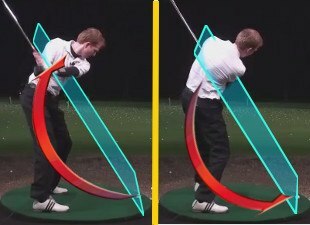 It also creates some inherent swing faults. An uphill slope tends to flatten the swing plane, making it more horizontal or rounded. With a majority of weight on your right side, it’s difficult to fire through the ball. Combine these factors and you get excess arm rotation through the shot, leading to pulls that often draw or hook farther left. When weight gets stuck on your right foot, the swing bottoms out before reaching the ball and you hit it fat. Read the next tip in this series to learn exactly how the ball reacts.